Do Viscosupplementation (Orthovisc, Synvisc, etc.) Injections Help With Osteoarthritis? 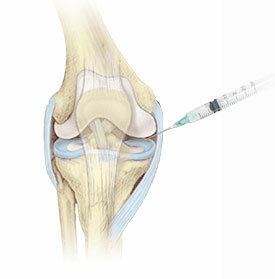 A relatively new procedure, called viscosupplementation, injects a preparation of hyaluronic acid into the knee joint. Hyaluronic acid is a naturally occurring substance found in the synovial (joint) fluid. It acts as a lubricant to enable bones to move smoothly over each other and as a shock absorber for joint loads. People with osteoarthritis ("wear-and-tear" arthritis) have a lower-than-normal concentration of hyaluronic acid in their joints. Viscosupplementation may be a therapeutic option for individuals with osteoarthritis of the knee. If there is any swelling (effusion) in the knee, your physician will remove (aspirate) the excess fluids before injecting the hyaluronic acid. Usually, this can be done at the same time, with only one needle injected into the joint, although some doctors may prefer to use two separate syringes. Depending on the product used, you will receive 3 to 5 shots over several weeks.